New shapes … French fancy!!! This new hat block is a quirky vintage inspired pill box I have named it French fancy as it reminded me of adorable French patisseries!!!! It is a small oval shape with a nice deep crown. 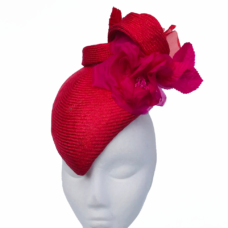 The detail on the crown is a swirl indentation which gives the hat definition and shape. This style looks amazing and rich blocked using a soft peachbloom wool felt. Making this hat I first heat the aluminum block up so it’s nice and hot. The felt has been gently steamed to soften the fabric. I then carefully place over the block and stretch and secure with cord to allow the felt to dry and shape . Once cool the hat is removed and I can begin to trim away the excess fabric and attach the brim wire (which keeps the hats shape). 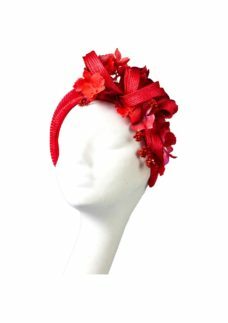 When the shape is correct I carefully sew ribbon or braid to the inner rim to hide the brim wire and provide a neat finish. Then the fun begins deciding on the trim for that hat. I love the use of hat net or veiling on this pill box but for a more structured look I just think simple well balanced trim in the same colour looks stunning. 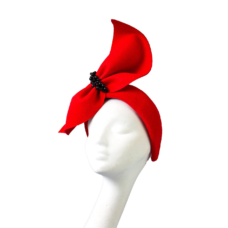 This hat would look fabulous with a simple shift dress, a structured box pleat skater skirt or a wool winter coat.